Birthday greeting card designer application makes hilarious cards and this reliable software is easy to use and you don’t require any prior practical training to operate this tool. In few easiest steps you can generate eye catching cards and it has special image designing object features to create imaginative cards according to your style and need. Now purchasing cards from the market is a obsolete way, creating pleasant cards through this comprehensive card generator application saves your time and money also. Birthday greeting card generator tool make high resolution and high quality greeting cards and these cards are really very attractive and superb quality. Quick and easy to use card builder software makes excellent cards and in few minutes you can create wonderful cards. Birthday greeting card designing application helps to make varied kind of card like funny card, humorous card, Photo card, standard card etc. Utility facilitates various features and options to create nice looking cards or you can create various shapes of cards through this software in a easy and simple manner. Card maker software creates superior quality birthday cards in a simple way and you can also add your message, images and photos in your homemade greeting card. Economical card maker application has versatile and flexible feature also and utility provides varied types of templates of special design and layout to create effective or heart catching cards. Features: *Efficient card maker application generates most prominent cards and you can also change the color and background color setting also according to your requirement. *With the assistance of blank format or wizard you can build attractive birthday cards. *Utility offers to generate multiple cards at a instance in few mouse clicks. 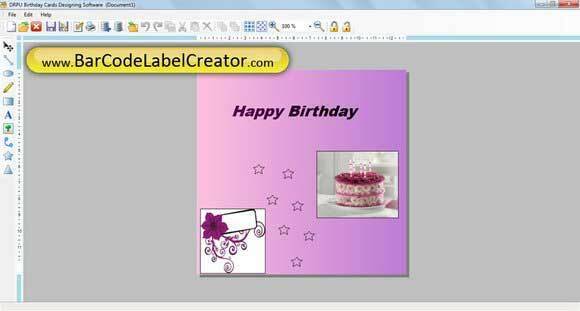 *You can create impressive and attractive birthday card through this advance card maker tool. Top 4 Download periodically updates software information of Birth Day Greeting Cards 7.3.0.1 full version from the publisher, but some information may be slightly out-of-date. Using warez version, crack, warez passwords, patches, serial numbers, registration codes, key generator, pirate key, keymaker or keygen for Birth Day Greeting Cards 7.3.0.1 license key is illegal and prevent future development of Birth Day Greeting Cards 7.3.0.1. Download links are directly from our mirrors or publisher's website, Birth Day Greeting Cards 7.3.0.1 torrent files or shared files from free file sharing and free upload services, including Rapidshare, HellShare, HotFile, FileServe, MegaUpload, YouSendIt, SendSpace, DepositFiles, Letitbit, MailBigFile, DropSend, MediaMax, LeapFile, zUpload, MyOtherDrive, DivShare or MediaFire, are not allowed! Your computer will be at risk getting infected with spyware, adware, viruses, worms, trojan horses, dialers, etc while you are searching and browsing these illegal sites which distribute a so called keygen, key generator, pirate key, serial number, warez full version or crack for Birth Day Greeting Cards 7.3.0.1 download. These infections might corrupt your computer installation or breach your privacy. A keygen or key generator might contain a trojan horse opening a backdoor on your computer. Hackers can use this backdoor to take control of your computer, copy data from your computer or to use your computer to distribute viruses and spam to other people.